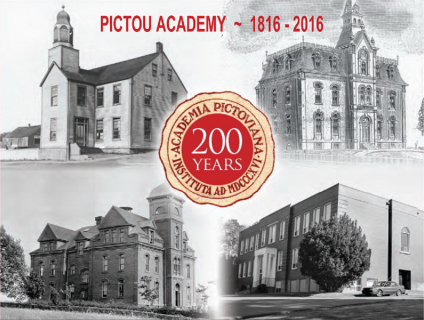 Pictou Academy, one of Canada’s oldest educational institutions, is celebrating its 200th anniversary this year. All former and current students and teachers are invited for a week of festivities, July 1st to 7th, leading into the Pictou Lobster Carnival. Grand opening and monument unveiling. Nostalgia evening with music and photo exhibit at the deCoste Entertainment Centre. To view the full roster of events, visit the Pictou Academy 200 website. As part of the 200th anniversary celebrations, Pictou County author Monica Graham has written a book about the history of the venerable school, which opened on March 26, 1816. The Cradle of Knowledge walks readers through the trials and tribulations of founder Dr. Thomas McCulloch in his quest to ensure education was available to all members of the community, regardless of religious background. For more information, visit the Pictou Academy 200 Facebook page, email pa200years@gmail.com or visit www.pictouacademy200.ca.